Planning a family trip to Bali in 2019? Great! Bali is an excellent choice for families. From the exotic coastline to lush rice terraces to diverse wildlife, Bali has the abundance of tourist attractions for all ages. Together with your beloved you can visit ancient temples, explore Bali safaris and experience the true Balinese culture by attending local annual events. 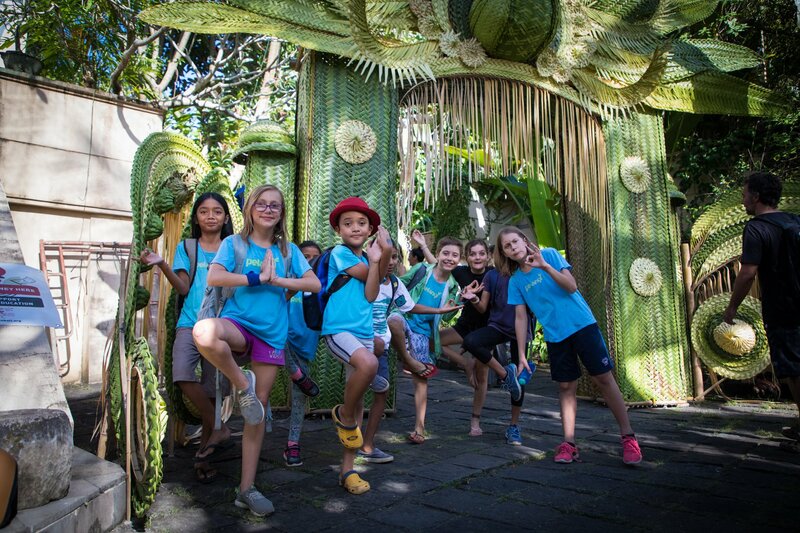 So, if you decided to opt for a Bali family vacation, you’ll get a lot to explore. Check out below the handpicked selection of family festivals and activities, and family-friendly villas for an unforgettable trip to Bali. Bali Spirit Festival is one of the world’s most inspiring and joyful yoga festivals. This family-friendly event offers great activities for all ages. Family programs like children’s yoga workshops, Bali Safari & Marine Park, seminars, Balinese dance & music, Dharma fair, etc. make it a must-visit for families. Bali celebrates Chinese New Year in around late January or mid-February every year. This unique festival is dedicated to Bali’s Chinese influence and can be a lot of fun & cultural enrichment for the visitors of the island. You can attend the glorious Chinese and Buddhist temples around the island at any time of the year. 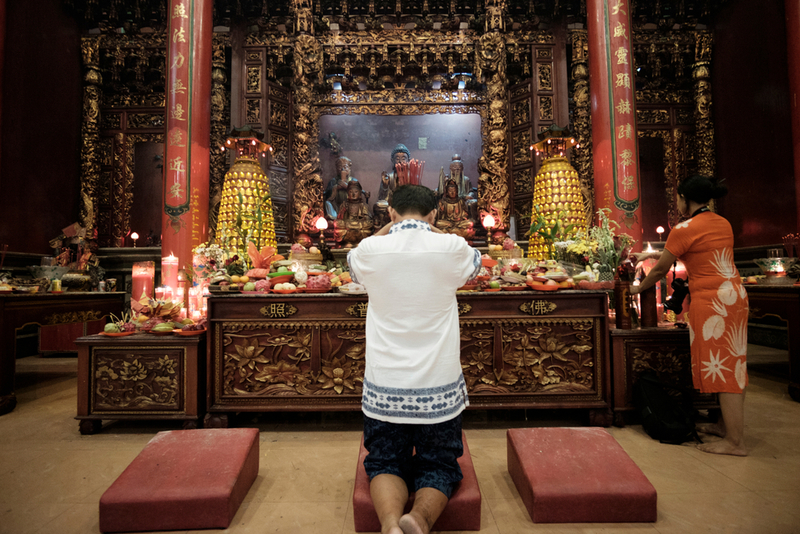 However, these temples are truly alive and festive during the celebration of Chinese New Year. 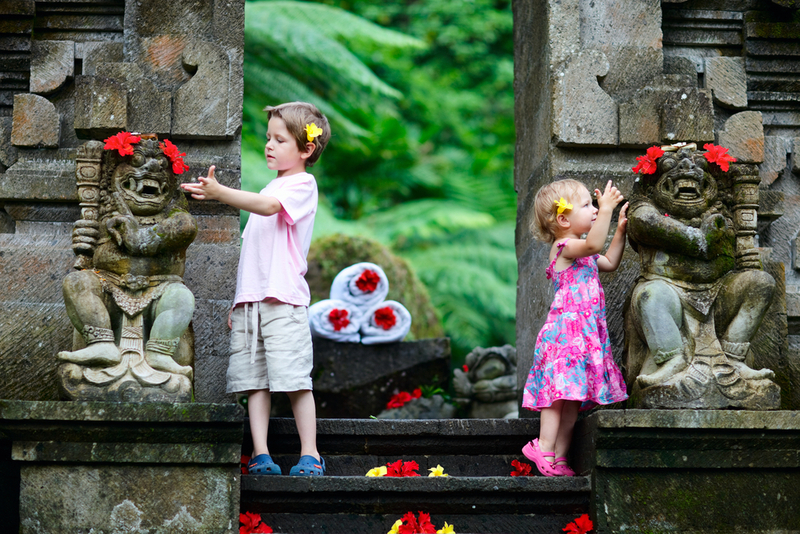 You will also get indulged in many family activities in Bali at the festival. You will see dance troupes of Chinese Barongsai lion and dragons, acrobatic stunts, and much more within the temple courtyards. Dine at the Chinese restaurants on your Bali family vacation for the occasion over speciality cuisines. Galungan festival marks the beginning of the Pawukon year. It celebrates the universe and victory of good against evil. This 10-day long festival ends with the Kuningan celebration of the soul and spirit purification. Balinese celebrate the festival with great pomp and show. Men prepare the festive dinner and women prepare delicious offerings like cakes. Men decorate bamboo trunks with corn cobs, yellow/white fabric and place it in front of each house. In addition, it is common to create beautiful and colourful offerings to the Gods…would you like to make one with your own hands? Are you wondering where to stay in Bali with family? 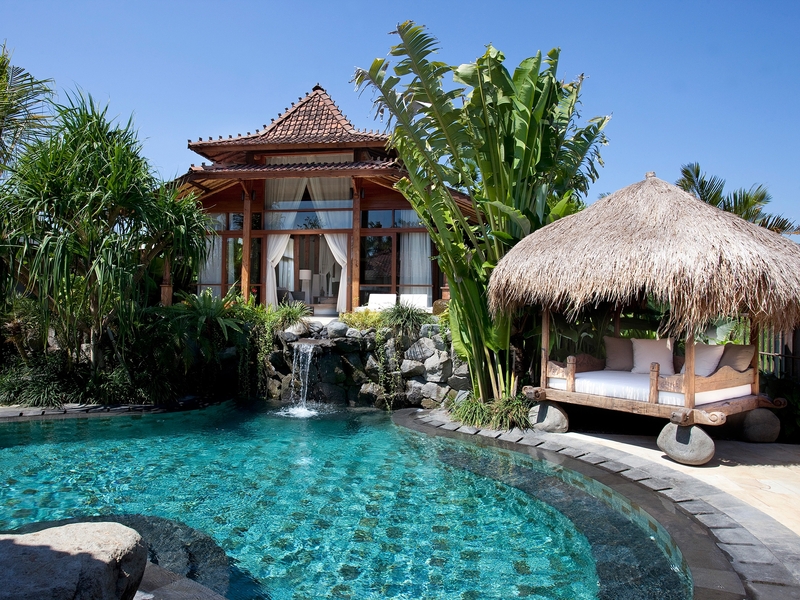 Check out the following best, private, luxurious and comfortable villas in Bali. Villa Amy is a luxurious, beachfront family villa with three pavilions. Swimming pools, lily ponds and a sheltered walkway decorated with antiques and artefacts separate each pavilion. Each bedroom in the villa is fully furnished and well decorated. This 3-bedroom villa is a paradise for families, seeking peace, comfort and privacy. All rooms have air-conditioning, iPod docks, flat-screen TVs with satellite channels, and ensuite bathrooms. You will get your private swimming pool and a garden for a relaxing evening walk. 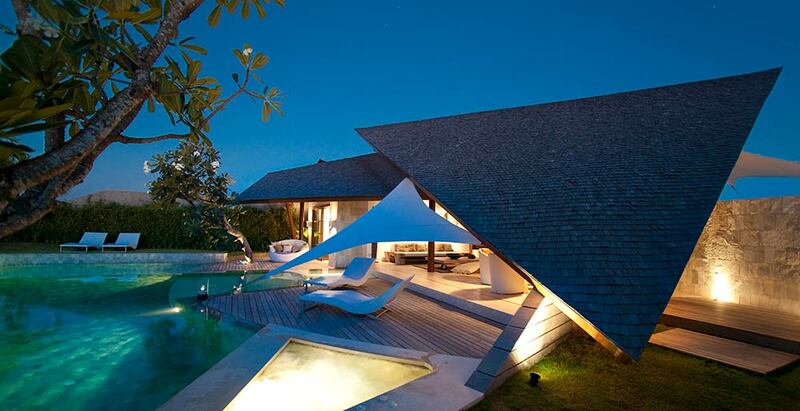 This spectacular villa resort sits in the heart of Seminyak. Its cutting-edge contemporary architecture and chic interior characterise 23 villas. Each individual villa provides breathtaking living spaces inspired by top architects and interior designers. Each villa has a private, infinity swimming pool and a manicured lush green garden. Villa Layer offers an unprecedented sense of comfort and privacy in its kind-sized bedrooms. Each room has glamorous and spacious bathrooms. Both indoor and outdoor areas are simply marvellous. Wondering where to stay in Bali with family to feel like home? 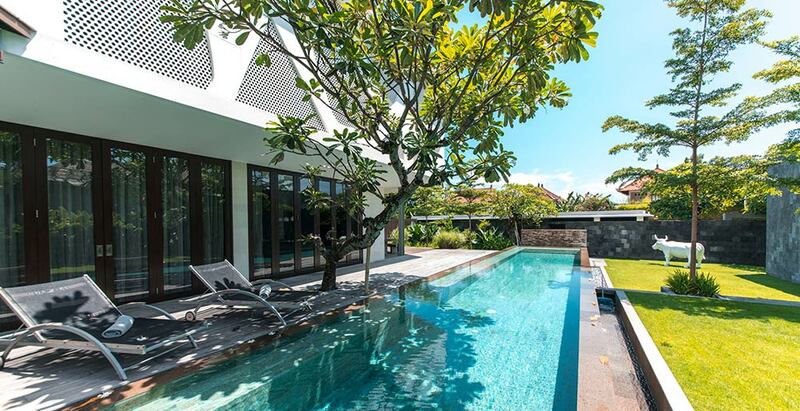 Nestled just a stone’s throw away from Seminyak beach, this super-stylish villa enjoys a great location. This 4-bedroom paradise has a private 25-meter swimming pool, chic dining spaces with a private chef, and a beautiful garden. It will also surprise you with a covered barbecue dining space and a timber deck above the pool. Finally, its private well-equipped gym will keep you fit even on your vacation. All bedrooms in Villa Issi are air-conditioned and have ensuite bathrooms & stlish design. Each room is equipped with a DVD player and 32-inch screen TV with satellite channels. 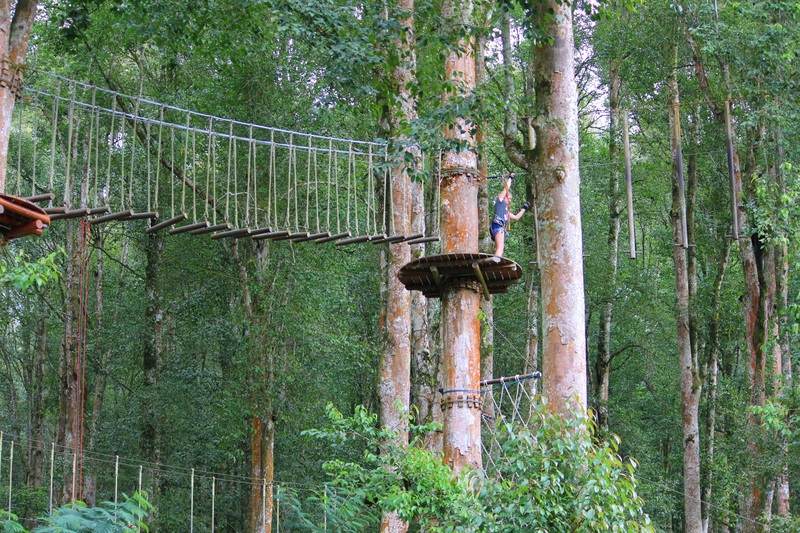 Walk high in the trees at this exhilarating treetop adventure park in Bali to boost your energy. This park has seven circuits of 72 challenges for all ages and all difficulty levels. You can choose any activity like Flying Swings, Tarzan Jumps, Suspended bridges, and many more fun challenges. It’s perfect for Bali family vacation when you seek both fun and adventure. All circuit platforms are equipped with safety measures. An innovative compression system used in the park protects trees from potential damages. Your kids certainly will love this library! 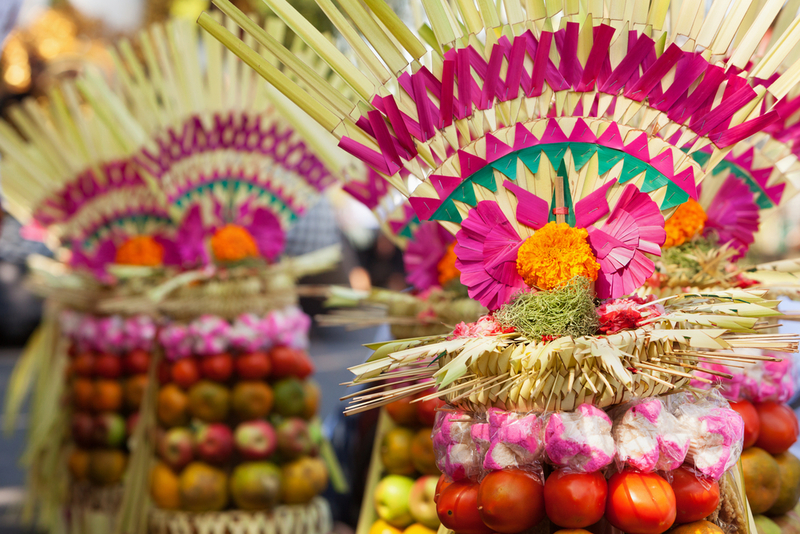 You will learn to make conventional Balinese offerings, play the gamelan, carve wonderful fruits and dance like anything. The Pondok Pekak Library is the one with a difference. It also has a fantastic collection of books. 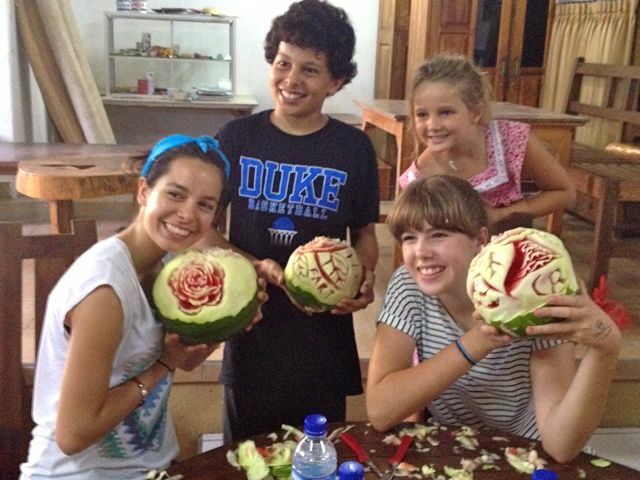 In addition, you will learn to make gorgeous Balinese jewellery and lovely wooden mask. You will make something interesting to take home with you, which will create a long-lasting memory for all family members. Learning can really be fun, for kids and adults alike, which this magical place will easily prove! With more than 80 unbelievably realistic paintings inspired by various themes, this incredible 3D Trick Art Gallery is a must-visit. You can stroll around the art and click interesting pictures in your camera. 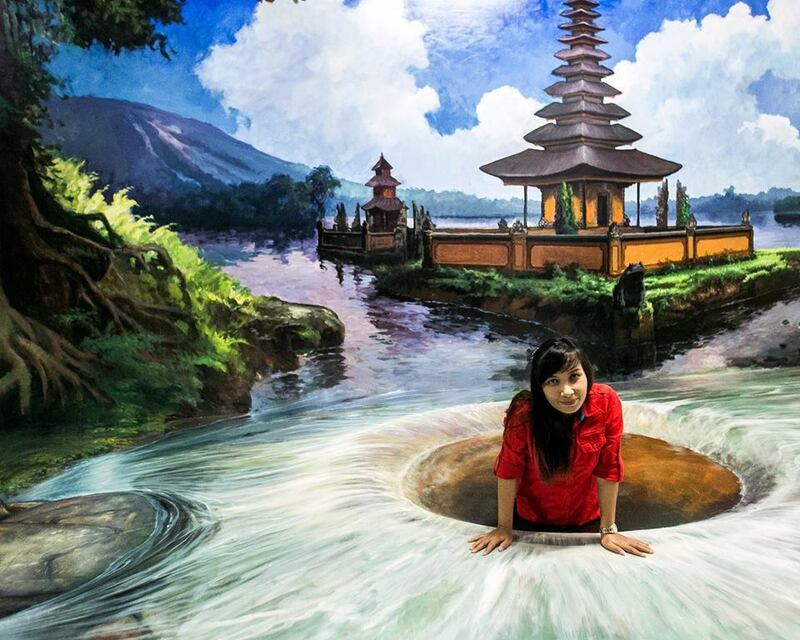 Visiting this art gallery is one of the best family activities in Bali. There are so many family-friendly backgrounds like being chased by dinosaur, horse-riding, reclining in a car and more. So, get creative with your poses! Free wifi is also available at the gallery so you can send the pictures to your friends straight away. Devdan dance and cultural show perfectly demonstrate the “Zeitgeist” of Indonesia. The rich and vast culture of the country marries the modernity elements at the show. 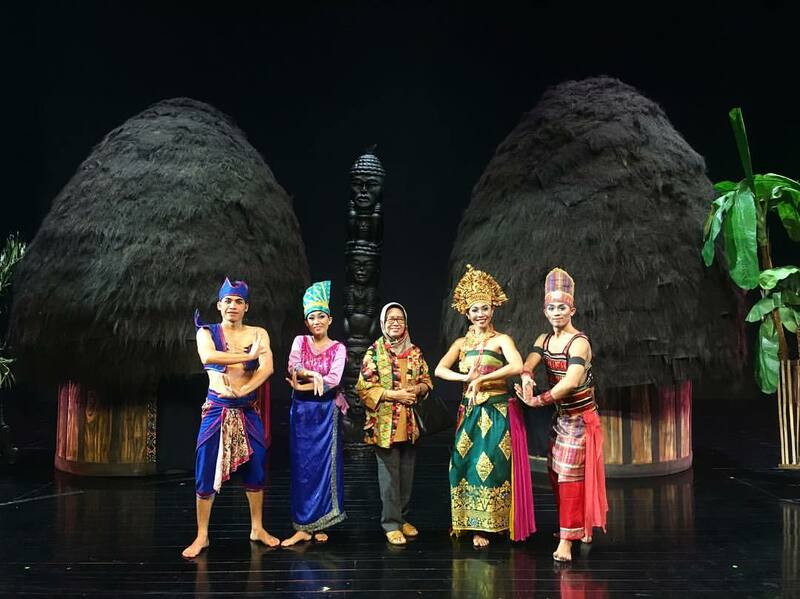 This 90-minutes breathtaking show takes on a cultural journey throughout Bali. You’ll see performances inspired by Java, Sumatra, Papua and Borneo. You will admire the amazing dance performances by dancers that will burst you with excitement with stage effects from flame bursts to torrential rain. Modern solo and duo acrobatic aerial acts will surprise you. Devdan show is perfect for all ages. It’s a visual and artistic introduction to different cultures and regions in Bali. Visit this place to feel like being an alien astronaut. The fun-filled rooms of the Upside Down House include a master bedroom, a properly arranged kitchen, toilets, and a dining room. It also has a laundry and a special room decorated with ancient antique and wooden stuff. You will float and experience what it feels like living in a house where everything is turned on its head – both kids and parents are faranteed to have a lot of fun! Bali Safari is a perfect destination to have an adventurous, enjoyable and educational experience. Visiting this place will make your Bali family vacation a memorable trip. The park accommodates more than 100 species of animals with some rare and endangered species. These include the Bali Mynah bird, the Komodo Dragon and Orangutan. You can also try such unusual options, as the Jungle Hopper, Night Safari, a breakfast with Lions, 4×4 Safari and Agung Show. 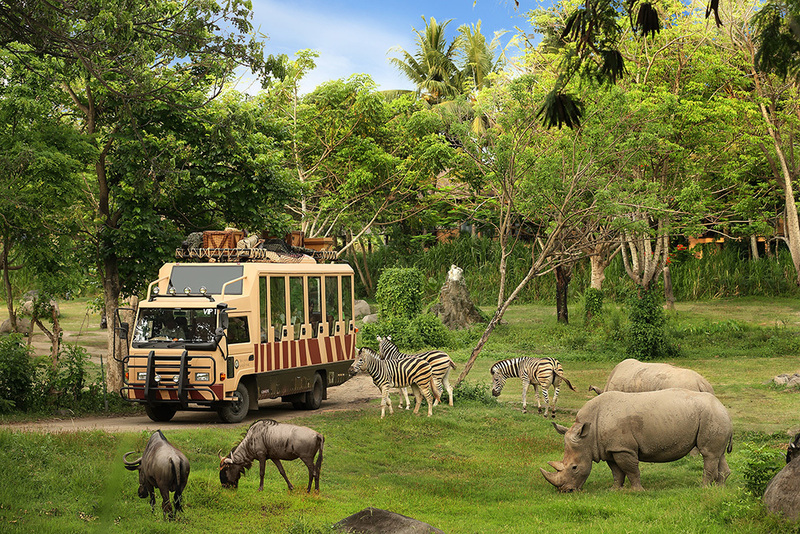 No doubts that Bali Safari is an exciting place for people of all ages. Your children will enjoy a lot at fun park spaces, interactive photo corners and splash zones together with unique animal species, while you can learn more about Asian flora & fauna and take part in unique experiences at the park.